In trying out the new Evernote beta for Mac, I ended up looking for a way to quickly send a selected Mail message to Evernote. I knew it was possible with AppleScript, but after searching on Google, I couldn’t find the perfect solution that fit my needs. Fortunately, by combining this script with an old tip by John Gruber, I managed to assemble a simple AppleScript that does exactly what I want. To ensure a lightweight communication between Evernote and Mail.app, I wanted to add message:// URLs to the note. Not widely documented, message:// is a URL scheme that Mail uses in combination with so-called “message IDs” to reference individual messages. It means that, on OS X, you can click such URL or manually launch one (from, say, Safari) to go directly to a message (it will open in a new Mail.app window). The first URL format listed above — message:%3cMESSAGE-ID%3e (no slashes) — is the one that Mail generates when you drag a message out of Mail. However, I have found that the second format — message://%3cMESSAGE-ID%3e (with slashes) — is better. Here’s why: if you paste the URL itself into a text field in any Cocoa app that uses NSTextView, you can then Control-click anywhere in the URL itself and use the Open URL and Make Link commands at the top of the contextual menu, because Cocoa will recognize the text as a URL. With Cocoa apps, that is still the case in Mountain Lion. By percent-encoding the < and > characters, apps like TextEdit and Safari will offer an “Open URL” option upon control-clicking any portion of the URL. But I’ve found Gruber’s suggested scheme has an advantage for Evernote as well. Evernote has a good AppleScript dictionary, and among the definitions of the suite there’s a “source URL” property that defines the source link for a specific note. Usually, this is used for notes that are clipped from webpages. In the new Evernote 5, source URLs are available from a popover in a “URL” field with a “View Site” button; they are also displayed as root domains above the note’s editor. In my tests, I’ve discovered that percent-encoded message:// URLs work better for Evernote’s source URL parameter. 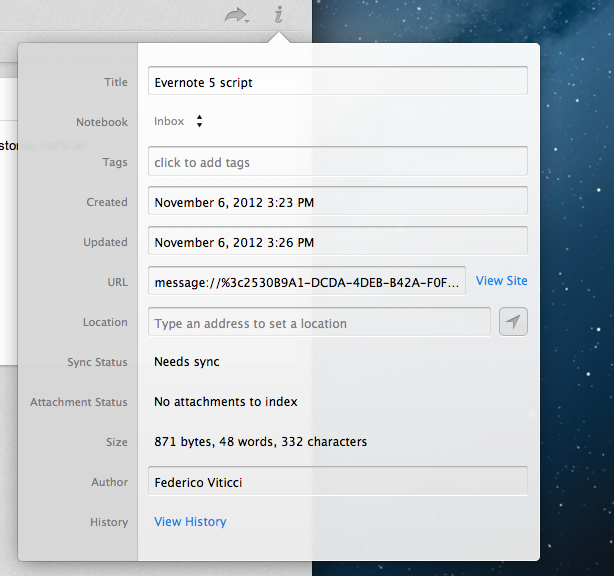 That URL format, in fact, becomes clickable in Evernote’s source field above the note editor. This is very handy if you want to open the original message in Mail without having to open the note’s detail popover first. I have, therefore, modified the original AppleScript to generate a message:// with John Gruber’s suggested method, using it as a source URL for a new note. set theMessageURL to "message://%3c" & theMessage's message id & "%3e"
As you can see, I also repeat the message:// URL as the first line of the note. I’m doing this for two reasons. First, if Evernote ever decides to abandon the source URL parameter, I can make sure the link to a message won’t get lost, as I’ll have a backup string in the main note. The second reason is related to the Evernote app for iOS: while message:// URLs don’t work on iOS, one can always hope. I feel more comfortable knowing that, sometime in the future, I’ll probably be able to tap on an inline link in Evernote for iOS instead of bringing up an additional menu. The AppleScript has its limitations, obiously. With rich HTML images containing backgrounds and other graphical layouts, it’ll only grab the text content of a message. Furthermore, because of the way it is designed, the script will capture the content of a message alongside every included quote level. Personally, I find this to be a nice plus (I always see an entire conversation in the note), but it’d be nice to have some kind of control on the contents of a message. To use the AppleScript, you can use apps like Alfred, Keyboard Maestro, or FastScripts to assign a keyboard shortcut to it. Otherwise, use the built-in OS X Script menu to invoke it when Mail is frontmost. If you have suggestions, feel free to ping me on Twitter or App.net.